Wildflowers, alpine meadows, gigantic old-growth trees, glaciers, deep canyons, waterfalls, snapped trees piled up to look like twigs for a giant’s bonfire, lush green forest floors, and I could go on and on. Mount Rainier was awesome! 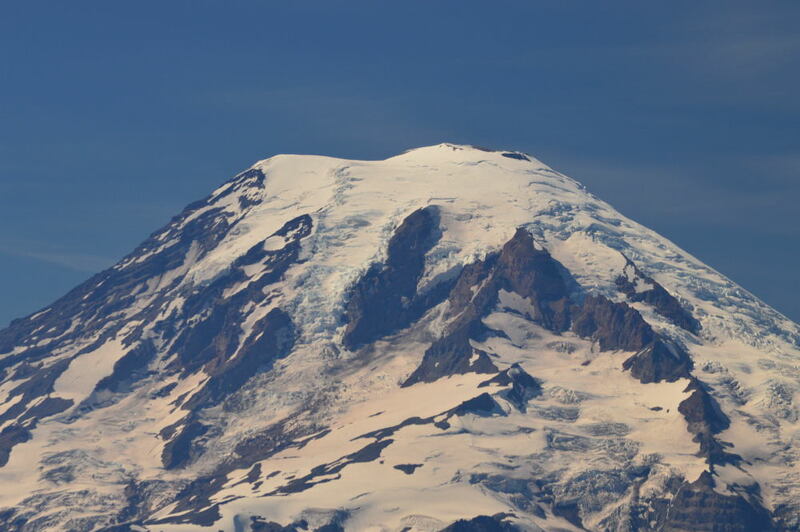 If someone told me that they were visiting Washington State and only had three days, I’d tell them to spend all three days at Mount Rainier – it was that amazing. We spent our mornings hiking amongst wildflowers and through snow and our afternoons hiking amongst ferns and dripping old-growth trees. We relaxed on the porch of a lodge in awe of the giant before us, and counted our lucky stars we were able to find a great campsite in the popular park. Although this park doesn’t seem to suffer from the incessant traffic jams that others do (I’m thinking of you, Yellowstone), available campsites were hard to come by. Fortunately, we found a fantastic site under towering evergreens. The campground was filled with families on one last hurrah for the summer. We ran into many experienced campers at the park, but two families stuck out. The first was a family camped a few sites away, between us and the bathroom. Each time I walked by, I marveled at the kitchen set-up that these folks had. Somehow, out of the back of a small pick-up truck, they managed to create a luxurious compound, replete with a massive tent and intricately overhanging tarp (necessary in these wet woods), chairs for the whole fam, a regular-sized sink complete with two 5-gallon collapsible buckets to serve as a water source and a graywater tank, a waist-high drying rack, a table for other important kitchen items, cords running all over the site with kitchen implements hanging within reach over the kitchen area, and a propane stove powered by a tank the size you’d have on your backyard grill. They win the prize for the most intricate campsite we’ve come across on this trip. The second family outdid us all. While were out hiking for the day, Alan came across a backpacker with an eight month-old strapped to her chest. She had just arrived at a trailhead and was talking with other hikers. Curious about her story, Alan overheard her explaining that she had just been out backpacking for twelve days with the wee one. TWELVE DAYS! Backpacking! And it wasn’t clear that the backpacking was over for the happy family – they may have just been refueling. Sometimes people tell us that it’s impressive that we’ve been on the road camping with a two-year old for over five months. Do not be impressed! We have not attempted backpacking, we haven’t even camped for twelve straight days – we always tend to take a one night break (or sometimes more) every week or so. And we’re not camping with an eight month old! Our little guy can walk, can tell us what he needs, and can even help out quite a bit around camp. Twelve days. Backpacking. Amazing! And so, amongst the backdrop of these extraordinary campers, we explored many nooks and crannies of this intensely beautiful park. The glaciered peak was as imposing as it was beautiful, and hiking up its flank amongst the wildflowers was a lesson in gratitude. Gratitude that we were able to see the peak on multiple days (a treat not granted to all park-goers given the common cloud cover), that we chose a time to visit when nature was showing off her finest colors, and that we were healthy enough to hike up, up, and up to see the massive glaciers that blanket the peak. 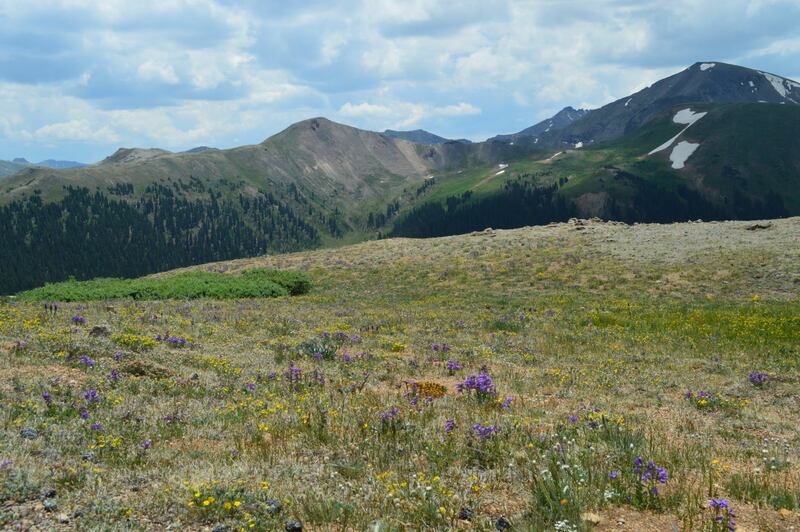 I’m not sure what was more beautiful, each individual wildflower or the mass of wildflowers dotting a slope. Regardless, lupines will always be my favorite. The massive, wet trees were a significant change from our forays through the Rockies and the Utah canyons. Although the trees were impressive, Van’s favorite thing was to point out the ferns (which he calls “F F Terns”) and then turn over the fronds to let us know whether or not there are spores. He can barely walk by a fern without checking for spores, which made for lengthy forest walks given the abundance of ferns in the lower elevations of the park. And off we are, once again, with the open road before us and no home awaiting our return. We drove west from Denver, heading over the Independence Pass to check out Aspen. The drive over the pass and to Aspen was gorgeous and looked to be a hiker’s paradise. If we were planning to stay in the area for the night (we weren’t), we definitely would have checked out a couple of the trails in the area. Instead, we headed to downtown Aspen to find a spot to picnic and check out the town. Alan predicted I wouldn’t think much of Aspen. He was right. So on we drove to Carbondale, a town we visited briefly a few weeks earlier. As we got out of our car, we heard the not-so-distant sounds of a funk band. Following the music through some backyards and alleyways, we found our way to a park with a large playground for Van. He played and played and clearly got over his temporary fear of slides while we listened to the funk band warm up for the evening’s concert. After Van was thoroughly played out, we walked out of the park between a heated croquet game and about fifty or sixty folks doing yoga. It turns out you don’t need to cut through backyards and alleyways to get to the park, so we took a much more direct way to the main street and did a little wandering before getting back in our car. 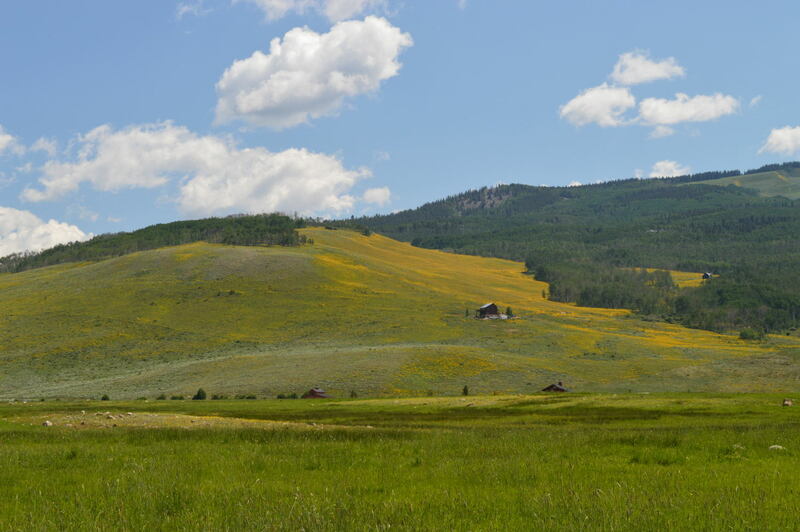 Our original plan was to camp for a night just south of Carbondale, but given Van’s mood (it was good), and where we wanted to get the next day, we decided to make today a long driving day and just drive all the way to Curecanti. We arrived just before the sun was setting, set up a quick camp, and feasted on a smorgasborg of hard-boiled eggs, cheese, crackers, and raisins. Living the high life, I know! The campground left some things to be desired for tenters, but it was practically deserted and overlooked the Blue Mesa Reservoir, so we couldn’t complain. 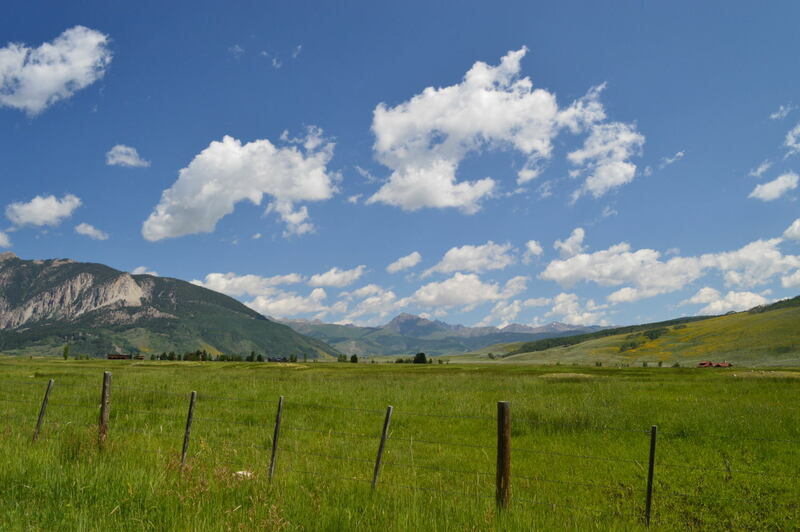 After our first of three nights in Curecanti, we hit the road to check out Crested Butte. How do I describe this area in a blog post? Shangri-La comes closest, but it’s hard to describe in words or in pictures – you kind of just have to go there. The day after we were in Crested Butte we met a family who had been there the same day as us. As we were sharing our stories of the hikes that we each took, our new friend told us that if she had seen a unicorn, she wouldn’t have been surprised. This, my friends, is the perfect description of Crested Butte. Crested Butte: the native habitat for the elusive unicorn. We started our day in Crested Butte hiking along a river, through wildflower meadows, and up a hill to aspen groves. Every few steps I proclaimed this to be the most beautiful hike I had ever taken. And then it would proceed to get more beautiful. This is the Colorado of postcards and magazine advertisements. I wanted the hike to go on forever. But, as all things naturally come to a conclusion, so did our hike. But not before we waded into the river to a gravel bar in the middle to play and eat lunch. It was a perfect morning. We spent the afternoon poking around town and checking out the library, both to entertain Van and to read up on how to change the light that went out on our car just hours after leaving Denver. The town did not disappoint. The people were friendly, the architecture was perfect for the location, and the sun was shining. Now I just need to find someone who has a vacation home in the area and needs a caretaker.